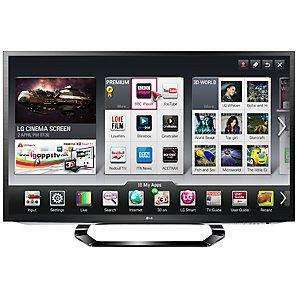 LG 47LM620T LED HD 1080p 3D Smart TV, 47 Inch with Freeview HD and 4x 3D Glasses & FREE 5 Year guarantee included!! £679.95 @ John Lewis! BACK IN STOCK! Just received an e-mail that the TV is back in stock! More than 10 available at the time of posting. Thanks to herby247 for original post. Got myself one this morning. Does anybody know if this has the same panel as the panasonic tx l47et5b? I believe it does, same screen but different processors. Personally I would go for the Panasonic. Yes the Panasonic uses the Same LG panel. Anyone knows about the input lag on this?? Hate LG TV's had nothing but issues with them. Last TV had to send back 3 times then they couldn't replace it. So bought another one, thought i'd give them another chance but oh what a surprise, already had to return it due to fault. Even the guys who pick up the TV's laugh at LG. i would have a read on the av forums from what i have read the led tvs seem to get banding or something,i was debating over this and a panosonic but after reading on there ive decided on this one,roll on monday! I've got the previous years model of this and the 3D is great on it, only issues I have are from the backlight edge bleeding, but due a new panel in there so hopefully this will solve the problem. You know with some of these internet telly deals.....it's actually cheaper to buy on the high st. Fenwicks of Newcastle, big department store, undercut every deal Ive seen for these things - PLUS they (used to anyways) give a 5 year back up deal. Ugly stand by the way. I thought I'd look for some figures for this. So actually the Samsung plasma draws just under 3 times as much. You know with some of these internet telly deals.....it's actually … You know with some of these internet telly deals.....it's actually cheaper to buy on the high st. Fenwicks of Newcastle, big department store, undercut every deal Ive seen for these things - PLUS they (used to anyways) give a 5 year back up deal. But if you purchase using CC you have protection against that. CC protection would cover you if the vendor took your money and became insolvent before giving you the goods. I don't think your CC would cover performance of the 5yr warranty, but happy for someone to correct me? I've got the 47lm 660t which has the magic remote. Despite people complaining about lag, I have no issues. Great image on skyhd, Xbox, USB hard drive. Plays mkvs and the 3d image is brilliant. Even 2d to 3d is fantastic. CC protection would cover you if the vendor took your money and became … CC protection would cover you if the vendor took your money and became insolvent before giving you the goods.I don't think your CC would cover performance of the 5yr warranty, but happy for someone to correct me? I've got the 47lm 660t which has the magic remote. Despite people … I've got the 47lm 660t which has the magic remote. Despite people complaining about lag, I have no issues. Great image on skyhd, Xbox, USB hard drive. Plays mkvs and the 3d image is brilliant. Even 2d to 3d is fantastic. really want to upgrade to a passive 3D LED tv, and LG seems the best at making them, even though Panasonic have brought out a range of these, but they're treating them as "budget" tvs so quality might be not as good as LGs, but people are saying this years LG models seems to be plagued by banding & gaming lags issues? any banding issues etc?really want to upgrade to a passive 3D LED tv, and … any banding issues etc?really want to upgrade to a passive 3D LED tv, and LG seems the best at making them, even though Panasonic have brought out a range of these, but they're treating them as "budget" tvs so quality might be not as good as LGs, but people are saying this years LG models seems to be plagued by banding & gaming lags issues? The 3d is brilliant, i've watched proper 3d content as well as 2d content such as mkvs and converted them to 3d. The depth control is fantastic and can get some popping visuals from a 2d content. I've watched footy on mine and played fifa/mw2 and experience no lag. When i play games, the tv sets itself to GAME mode so that may be a reason why i experience no lag/ghosting. I thought I'd look for some figures for this.From their respective … I thought I'd look for some figures for this.From their respective Amazon.co.uk pages:Based on the power consumption of the television operating 4 hours per day for 365 days:LG 47LM620T	= 92 Kilowatt Hours per year, (at 12p/KwH that's £11.04)PS51E6500 = 272 Kilowatt Hours per year, (at 12p/KwH that's £32.64)So actually the Samsung plasma draws just under 3 times as much. first 3d tv and im blown away with it. Bought mine from Richer Sounds. same price with 5 year warranty included. i prefer to deal with Richer Sounds than John Lewis. Feels more personal. If you like to watch football on tv the stay away from LG tv's as they all suffer from dirty screen effect. I've ha a few and all were the same. Not a bad price for a tv to watch bluray and hd telly but not sport tho! 1. which would rather replace when you sit on them / scratch then lens? - the pricey active, or the keep from the cinema passive? 2. what you going to do mid movie when the batteries fail? It's £589.95 at Richer Sounds (minus the 5 year guarantee) but add 10% for the guarantee, which works out slightly cheaper than John Lewis. that's a smaller tv though ! Youll probably get banding on these led's what ever the manufacturer...I have a lg lm670t and that has banding which is impossible to hide,Just need watch any sport with panning shots and youll see it. Coming from a neo pd panasonic plasma i got to give the lg 10/10 for picture quality,easily matches my calibrated plasma on hd,blacks not so good but that is expected. I will say plasmas arent perfect also as my panasonic has posteration/false conturing problems which ive put up with for 2 years, it just at the moment it feels more liveable even over the extra goodies and the stunning looks the lm670t has. Isnt richer sounds warranty much better than jl. Thought jl warranty was on a sliding scale after first year while Richers didn't "depreciate"
I have this tv (this years model) and it's the best telly I've owned- no banding issues at all, no input lag (once you turn all the digital enhancement program's to 'off' and just the panel do its thing). The 3D works very well with both dedicated blurays and even mkv files from my n40l. If you buy this simply install plex server on your pc/server and after plex has scanned your content you will have the movies &tv programmes showing up on the Smart Share app on the tv which you can stream without any issues- just works. At this price it's a steal! what are you guys going to do about dongles? you gonna hard wire or are there generic dongles we can use.. do they have to be LG dongles with software on them?